Every sport has its own set of primary muscles responsible for the majority of work of the sports specific motion. Primary muscles, or movers, are the first muscles called upon when there is a need for increased speed or force. For a cyclist, these muscles are located in the hips and legs. Sometimes referred to as pistons, the legs, revolving at 80 to 100 reps per minute, are what’s responsible for producing power and speed. For a road cyclist pedaling while in the saddle, most of the power happens between the 12 o’clock and 5 o’clock position of the pedal stroke. This is when a majority of the primary muscles are activated. Hip flexion, along with hip and knee extension are the primary movements of a pedal stroke. Between the 6 and 12 o’clock position in the pedal revolution, there is some knee flexion to help bring the pedal back to the top but helping that flexion is the greater downward force being placed on the opposite pedal, by the opposite leg. Any extra help bringing the returning pedal back to the top is a benefit. The muscles that help return the foot to the top range from the hamstrings and calves at the bottom of the stroke, pulling the foot backwards, to the quadriceps at the top, lifting the foot and knee back to the 12 o’clock position. The power phase happens while the hip and knee extends, pressing downward on the pedal. This action starts with a combination of the gluteus and quadriceps muscles, but then is joined by the hamstrings and calf muscles a quarter ways through the revolution. This shows the need for equally strong hamstrings, hips, and quadriceps. 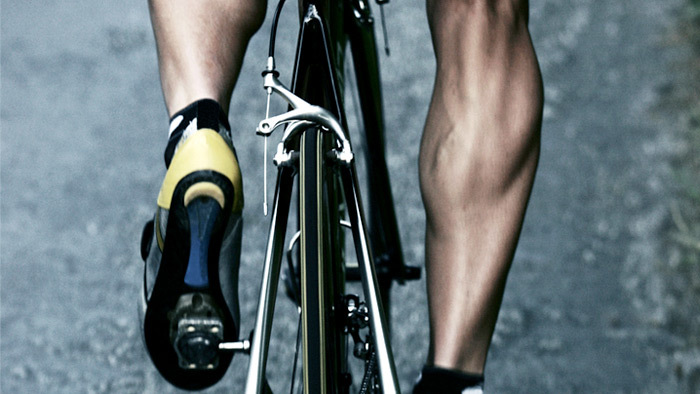 These groups of muscle make up the largest volume of muscles used in a pedal revolution. When it comes to strength training for the bike, there is not one group of muscle that is more important to focus on than the other. All of the muscles listed above play a key role in producing power on the bike. Additionally, one area of strength that is not the focus of this article but is crucial to strength on the bike is core strength. So the most productive strength training off the bike will incorporate the muscles of the legs and the core at the same time as often as possible. Below is a short list of the best exercises you can perform to build your strength. Squats focus on the gluteus, quadriceps, hamstrings, and core muscles. Power phase for a squat is similar to the power phase on the bike, both requiring hip and knee extension. These target the hamstrings, hips and lower back. Working one leg at a time will help correct muscle imbalances since each leg is forced to support the load independently. These can be done with or without weights. These target the soleus and gastrocnemius muscles. On the bike strength training also plays a key role. Seated and standing muscle force efforts done on hill climbs will target all of the muscles listed above. Seated force efforts will place a large amount of stress on the quadriceps while standing force efforts will target more of the hamstrings. Both seated and standing efforts are important and are usually done with a slower cadence and harder gearing, requiring the need for greater force to be placed on the pedal. Force efforts will build greater strength and endurance in the legs. It is important to make sure you space out your force effort days far enough apart to recover from them, as too many too often can lead to tight muscles and injury. Leg speed and efficiency are also important. Fast cadence, seated efforts will target hip flexion and the rectus femoris, the quadriceps muscle that engages to lift the knee and foot up to and over the 12 o’clock position of the pedal stroke. This muscle action also helps the opposite leg finish off the downward power phase. Increasing your cadence will also increase activation of the calf muscles1,2.These efforts help build greater aerobic strength in both the non-power and power phase of the pedal stroke, which will lead to greater pedaling efficiency during a race. Fast cadence efforts can be used throughout the year but are especially important as you get closer to your peak event. As you train and build fatigue, primary muscles are going to become tight. Focus on simple stretches – such as touching your toes while standing, with straight legs, to stretch the hamstrings, pulling your heel towards your buttocks while standing to stretch the quadriceps and hip flexors, and calf stretches such as pulling the toes towards you with a towel or band while seated with straight legs. Beyond the primary movers for a sport specific action, there are many other aspects that play an important role. The lungs and the ability to transfer oxygen to the muscles, the mental strength it takes to train continuously, and all the secondary, assistance muscles play a crucial role in overall strength. Your primary muscles for a given sport will always take on most off the work, but they will only be as strong as the entire system as a whole.